After a successful opening weekend during the Lunar New Year season, Donnie Yen’s (甄子丹) The Monkey King <西遊記之大鬧天宮> has continued to reign at the box office. Nineteen days after its release on January 31, it officially broke 1 billion RMB in ticket sales, becoming the third movie to do so in Chinese film history. Since its first day in theaters, The Monkey King has been breaking box office records left, right, and center. It was the first Chinese film to break 100 million RMB on its first day, as well as the highest-grossing film on Lunar New Year in Chinese movie history. Apart from setting box office records for first-day sales, single-day sales, and first-weekend sales, The Monkey King also led box office sales for fourteen consecutive days. Despite going against romantic blockbusters tailor-made for the combined Valentine’s Day and Lantern Festival holiday, The Monkey King still managed to hold on to a second-place box office ranking, nineteen days after its initial release. The film has raked in more than 1 billion RMB in sales, making it the third Chinese film to break 1 billion RMB after the 2012 comedy Lost in Thailand <人再囧途之泰囧> and the 2013 action-comedy Journey to the West: Conquering the Demons <西游•降魔篇>. Apart from mainland China, The Monkey King has also enjoyed a successful release in 32 other countries and regions, including Hong Kong, Macau, Taiwan, Malaysia, and Singapore, where ticket sales have totaled 16 million USD so far. The film’s producers hope that after The Monkey King opens in Japan, Korea, North America, South America, and Europe, the film will break the Chinese-film worldwide sales record previously set by Crouching Tiger, Hidden Dragon <臥虎藏龍>, which grossed 230 million USD. really? it was one the worst movie. terrible CGI. CGI was by a Hollywood team. A friend told me in the sequel Huang Xiaoming will takeover from Donnie? True? Anyway yes the CGI was terrible but the costumes were ok.
Well, it’s said that Huang Xiao Ming might take on the role of the pig..
how much did this movie make in hk by its self? The movie lacks depth. No story telling, no emotions. Just a continuous series of fighting and fights and more fights to milk every opportunity to use CGI. In the end, its like playing a video game. The CGI is also not top notch. Maybe with 3D glasses, it may look betetr. The thing about mainland audience is, as long as you give them decent CGI fare on 3D, it becomes a winner. It’s just that I finished the movie without knowing what happened. I was like em, what? And I wonder if I was mentally-away or was the Hong Kong version cut shorted but the Fan-princess and Bull Demon very hyped about romancing relationship wasn’t that… obvious and touching. It was just plain sad for the Fan-princess that the Bull Demon didn’t want to listen to her. Is that why they keep promoting this as a tragedy romance? Actually unlike the bulk of reviewers, I felt the movie was okay. Nothing awe-inspiring, but man did I love the cast. Donnie Yen was amazing as The Monkey King. He was convincing to me as a monkey, and didn’t feel contrived at all. At first it was awkward for me to watch but his acting slowly warmed me up to his character. And the rest of the cast was wonderful as well. Nothing to complain about. But to be honest, if it wasn’t for the cast, the story might just be a bit lacking. 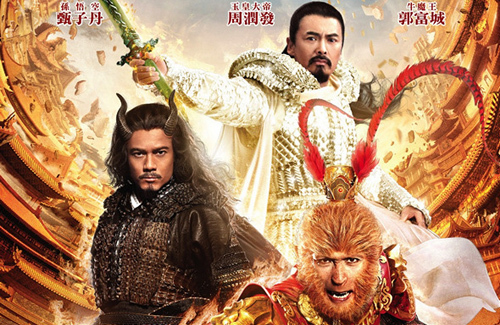 The movie itself was really nothing more than a retelling of The Monkey King, focused solely on the development of the main character, and mildly touching on the rest of the cast. There were some details in the plot that made way more sense to me than in any of the renditions of the Monkey King that I watched. For example why was the “Fan” princess, a princess? From this film I learned she was a princess because her brother was the Emperor of the Heavens. I mean, whether or not that’s true isn’t really a big deal to me, but it helped me to make sense of the other previous versions of the story. And yes, there were some incongruent parts in the film such as why on earth did the Fan Princess love the cattle beast so much to betray her home? (I heard they did some major editing and cut out quite a bit of the actual movie which is a shame. I would love to see more Aaron and Joe’s chemistry.) And that whole underwater CGI segment was just horrendous. But some parts of the movie moved me too, like when the monkey clan got wiped out and wolf spirit died and Donnie was furious. And they kept his Donnie’s character extremely true to his personality and role. I didn’t feel like the Monkey wasn’t the monkey at all. That’s one of the things I felt grateful about the movie at all – it’s that they kept the Monkey true to character. Even in scenes with the wolf spirit, where typically the audience would expect some lovey-dovey scenarios, the monkey was still his insensitive, crazy old self. All in all, the movie wasn’t superb, but the cast did make up for big parts of it. If for nothing else, Donnie Yen, Chow Yun Fat, Peter Ho, Aaron Kwok, Joe Chen, etc. So star studded.